I still feel terrible. My head is pounding and I really don't know how I am going to function until tomorrow night with very little sleep ... especially given the very little sleep I've already been functioning on. Earlier, before I stepped outside to run more errands, it took me literally 20 minutes just to put on a pullover t-shirt & the jeans I wear almost every day. Not rocket science, folks, but so far I'm getting an F- in life this week, and I think the gold stars fell behind the refrigerator again, if you know what I'm saying. 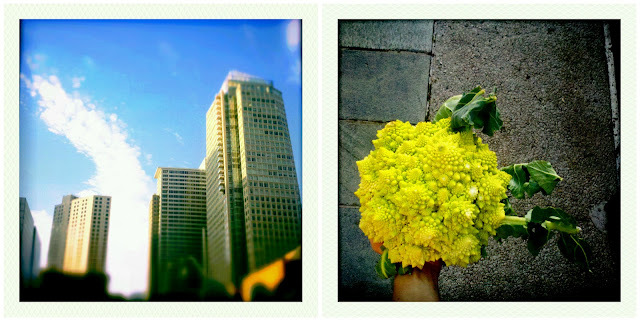 LEFT: Happy gorgeous summerlike day, SFers; RIGHT: the biggest romanesco I've ever seen, & it's MINE! 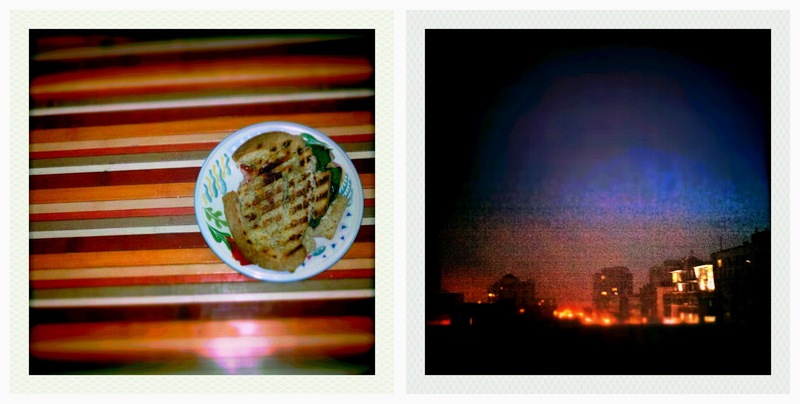 LEFT: The first panini off of our new panini grill; RIGHT: amazing sunrise in the fog on Wednesday morning. In other news, I'm still totally blown away/shocked/laughing about this Facebook ban thing. For those who didn't read the earlier entry this morning, a second burlesque photo that I took was removed by Facebook for being "pornographic" (and it wasn't, for the record), and they blocked me from using my account for 24 hours, along with a threat of closing my accounts if it happens again. I knew that Facebook threatened account deletion, and that it wasn't unheard of for it to happen, but suspending someone's write privileges on their own account? What's that for, so they can go sit in the corner in a timeout and think about what they've done? I certainly felt that Facebook wanted me to walk around with a dunce cap on my head today, so I could be taught a lesson. Well, lesson learned; but it's really the threat of deletion that freaks me out, not this 24-hour twilight zone where I am not allowed ownership of my own profile. Also distressing is just how much I use Facebook during a given day. Today was rough. I didn't know what to do. Tweeting just didn't give me the same satisfaction as Facebook interaction does. I wanted to upload photos. I kept typing comments only to have them deleted in a flurry of error messages. I couldn't respond to chat messages. Bizarre times. I can't wait to have my permissions back tomorrow. & yes, Zuckerberg, you are a grade A douche, not that most people ever thought you weren't, but oh yeah: it's on now, dude.